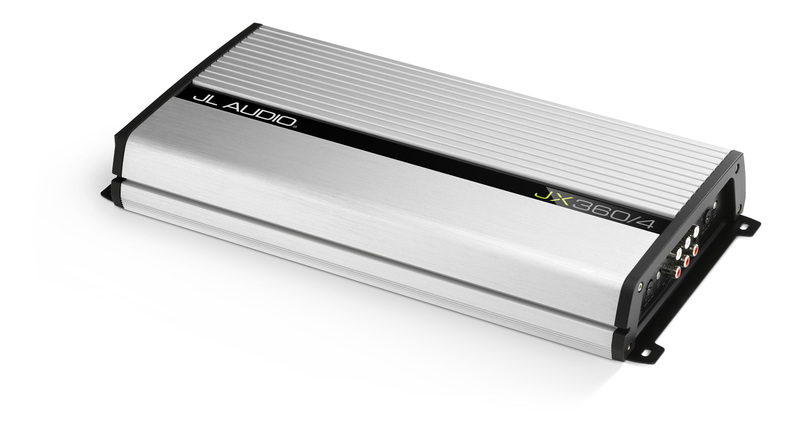 Dallas, TX—November 5, 2010—JL Audio has unveiled a new series of mobile audio amplifiers, dubbed “JX”, aimed at entry-level customers seeking high quality audio. JL Audio will begin shipping to authorized dealers in November, 2010. Two full-range models (JX360/2 and JX360/4) offer well-proven Class A/B designs with rugged unregulated MOSFET power supplies and high-mass heat sinks to effectively dissipate heat. On-board active filters can be used in high-pass or low-pass mode and pass-through pre-amp outputs provide additional system wiring flexibility. High-level wired and low-level RCA-type inputs are provided for easy connection to a wide range of source units and systems. Two monoblock models (JX250/1 and JX500/1) feature linear amplifier designs, while the 1000/1D monoblock offers an ultra-efficient Class D circuit to reduce physical size and current draw. All three monoblocks feature variable low-pass filters, pass-through preamp outputs, variable Bass EQ boost and remote level control via an optional wired controller. As with the full-range models, high-level wired and low-level RCA-type inputs are provided for easy connection to a wide range of source units and systems. The industrial design was done in-house and led by company CEO and Chief Engineer Lucio Proni, who set out to create a clean, uncluttered high-end look without extraneous ornamentation. The sleek extrusion is simply adorned by a gloss black ID panel with the model number and the JL Audio brand logo. Digital images and a downloadable version of this press release are available at www.nicollpr.com/jlaudio or by contacting Lucette Nicoll, Nicoll Public Relations at: 781-762-9300/lucette@nicollpr.com. Founded in 1975 in Miramar, Florida, JL Audio is a privately held American company manufacturing high-end audio solutions for home audio, mobile and marine electronics designs. JL Audio products are sold exclusively by specialty retailers throughout the U.S.A. and distributed in fifty-eight countries around the world. Recipient of numerous awards and accolades, JL Audio loudspeakers, amplifiers and subwoofers have been awarded fourteen U.S. patents for innovative audio technology.